Luther’s purpose in composing the theses was to set forth his case against indulgences and expose the practices of some clergy and church agents who misused and sold indulgences. The theses were written for the theological-academic community to read and they were fashioned accordingly. They set forth propositions, asked questions, included hear-say evidence, and made assertions. Even though current readers might not understand all the jots and tittles of Luther’s theses, the gist of his presentation comes forth. To grasp the full context and impact of them one would have to live in the early sixteenth century with its very different lifestyle and experience the centrality of the papacy to all of life. As for the content of the theses, Luther introduced them with a simple call to debate. He presented his credentials, expressed his desire to get to the truth, and invited interested parties to visit Wittenberg for debate. The theses speak to the true nature of repentance, the powers, and responsibilities of the pope and priests, and then there are a number of theses more pointedly addressing the indulgences themselves. It all flows well, with a few rough spots, as Luther made his case. He was particularly penetrating when he spoke to how the poor were taken advantage of by the church and mentioned that some parishioners were struggling with household budgets because they were spending so much money on indulgences. He listed several theses beginning with the words, “Christians should be taught,” because he was troubled that the people were kept in ignorance about the full meaning of an indulgence and its purpose. He mentioned the responsibility that the papacy had to handle its ministry appropriately and recognize the limits of its authority. As he neared the end of the theses, Luther turned to the parishioners for evidence by showing how their common-sense observations pointed out some of the abuses of the indulgence system. He was very careful regarding what he said about the pope and commented that others within the clergy were the culprits unbeknownst to the pope. However, Luther was treading on dangerous ground because all roads of authority and control led to the pope. Luther’s debate in Wittenberg did not take place. Despite his careful wording of the theses, it was clear to all that he was not only questioning indulgences but also the authority and power structure of the papacy. Many were incensed with Luther while others were sympathetic to the views expressed by him. 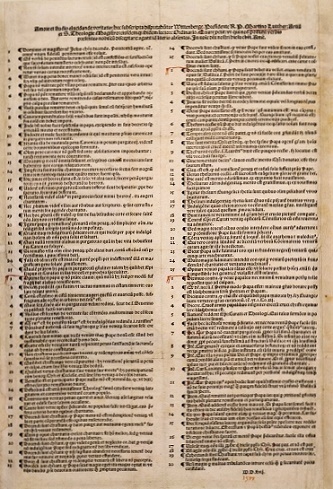 Less than a year after the theses were posted, Luther published a commentary on their content with the title, An Explanation of the Ninety-Five Theses. The explanation not only addressed the theses but other aspects of Luther’s reforms such as justification by faith and what is known as his theology of the cross. In the American edition of Luther’s Works, vol. 31, his explanation required 174 pages, but the theses needed merely nine. The copy of the theses available for download has been compiled from other English sources listed at the end of the text of the theses. More information about indulgences is at the bottom of the first page. There are also some notes on the last page of the PDF which have been referenced to help in understanding the theses.